Art Gallery Cards: One Page Wonder--Wonder!! Last Thursday's One Page Wonder workshop was such fun! 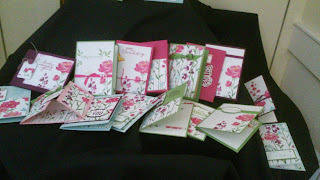 I provided an inspiration sheet but my talented stampers just took off on their own and let their creative juices flow! We enjoyed a relaxed afternoon and the good company of enthusiastic stampers! Thank you, Jane, Dara, Nancy, Sydney and Mike! Here are just a few of their creations! !